Capsule Summary: Hawkeye is in desperate need of a new pair of boots but everybody wants something before they’ll help him. I love this episode. It’s definitely silly, and reminiscent of Season 1’s “The Long-John Flap,” but I still enjoy how Hawkeye and Trapper get caught up in an increasingly complex web of wheeling and dealing that ultimately falls apart in spectacular fashion. I’d forgotten exactly why the plan to get the boots collapsed, which made rewatching the episode much more fun. Am I the only one who feels a little bit sorry for Frank? Hawkeye stuffing Frank’s wife’s birthday card into his boot is actually a pretty awful thing to do. It’s also tough to hear Frank discussing how sad his birthday parties were when he was a kid. He’s just self-aware enough to recognize that people don’t like him but seemingly incapable of understanding why. At his surprise birthday party, he seems genuinely excited. He says its the happiest night of his life and even calls Hawkeye and Trapper his buddies just before the whole thing falls apart. Later, while arguing with Margaret about cutting his birthday cake, Frank seems so pathetic. He whines and Margaret tells him to act like man and calls him a twit. It’s sad. Trapper has zipped his fly to new heights. Suzanne Zenor’s name in the closing credits is unusually prominent and I’m not sure why. She doesn’t have a very big role. There are plenty of familiar faces in the background at Frank’s party: Jeff Maxwell, Kellye Nakahara, Roy Goldman, Dennis Troy, and Sheila Lauritsen. Lauritsen has just one line in the episode–“Hawkeye, is that your hand?”–but that’s enough to earn her a credit for her appearance. “For Want of a Boot” marks her last credited appearance but she’s seen in at least one additional episode. Johnny Haymer makes his first guest appearance as Sgt. Zale in this episode. It’s also the first credited appearance for Patricia Stevens, although I believe she’s in a few earlier episodes uncredited. Father Mulcahy is not in this episode. Hawkeye: Hey, you know he’s only joking. Trapper: Yeah, in our hearts you’re six-foot-three. Hawkeye: Which one is she? Radar: That new first lieutenant, the big blond lady. 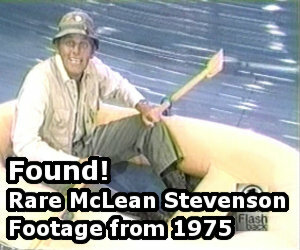 Trapper: Murphy? The wonder nurse? Hawkeye: She’s two people taller than you. 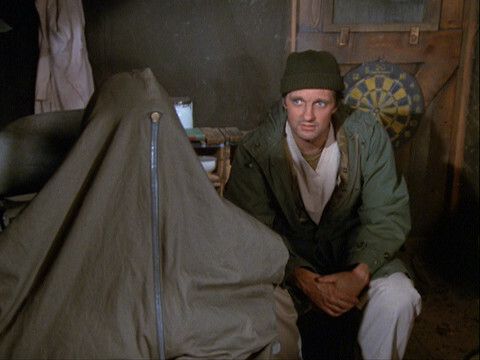 Trapper: Be smart, Radar. Start in the boy’s department. Work your way up to the men’s floor. Hawkeye: Give us a little time, we’ll find you something in 32 regular. HENRY: Radar, tell me the truth. Do you understand all of this army stuff? RADAR: Uh, I try not to, sir. Slows up the works. There is one little oddity: did anyone notice that Klinger refered to Margaret as Major O’Houlihan, which was her last name in the novel and movie. I don’t mean to be “that guy,” but it’s Houlihan in the original novel. It’s also technically Houlihan in the movie, but Henry constantly refers to her as O’Houlihan, leading to the subsequent confusion nowadays. This was either as an intentional show of incompetence or a genuine mistake on the part of Roger Bowen. (I’ve heard both.) If you listen during the scene where she and Frank write the letter during Trapper’s party, she clearly refers to herself as simply Houlihan. I wasn’t aware of that. I’ve only seen the movie in pieces, but I’ve noticed that sources online like IMDb and such list her name as O’Houlihan – I assumed that because the movie was adapted from the novel that her name was originally such, but for some reason, was changed to just Houlihan for the series. I’ve heard conflicting things about Radar’s real name too: Gary said he asked Larry and Gene to give him a real name, hence why he reveals his name to be Walter in “Quo Vadis, Captain Chandler?” yet supposedly Radar already had a real name in the novel (or, at least, the bizarre sequel novels) that differed significantly . . . I don’t remember what the name was, but it certainly wasn’t Walter. RJ, you’re not the only one who feels sympathy for Frank. This has got to be in my top 20 or 30 episodes, for two reasons. Some of the dialogue exchange is golden, and how spectacularly the whole shenanigan collapsed. I can’t really think of anything else to say that hasn’t already been said! BDOR: Yeah, the O’Houlihan thing is an easy mistake to make, since she IS called that quite a bit in the film; even online sources seem to vary between the two spellings. RE: Radar. His name in the books was J. Robespierre O’Reilly. Definitely try to watch the entire 1970 film; its certainly different for those accustomed to the series, but you can see where the earlier part of season one was taking inspiration from (IMO it’s also a terrific movie). Also, while the movie is based on the 1968 book, it often differs significantly. If you haven’t read the original novel, definitely give it a go (as well as the two ‘legit’ sequels: M*A*S*H Goes To Maine & M*A*S*H Mania; ignore all the increasingly terrible ‘fake’ sequels between Maine & Mania). Is it me or does Futterman, the dentist look like Wayne Knight from “Seinfeld”? They both have a certain portliness about them. The Dentist, Futterman, was Michael Lerner. I just watched it. I had the same thought but found it untrue within the credits. YES! My husband and I just had this discussion. I’m definitely in the minority here, but I’ve never liked this episode. Yes, it is funny; yes, it has some great dialog ….but the holes in the plot negate the humor for me. – If there is one thing the army has no shortage of, it is boots. – Instead of trying to placate the quartermaster why didn’t Hawkeye go to Radar, who is known to scrounge anything from a generator to an autoclave with a couple of phone calls. This episode made me hate Frank. Did anybody notice the scene where Charles thinks he’s leaving and he’s in the officer’s club trying to get a drink. He has a conversation with Igor. And for whatever reason Igors entire conversation seemed to be voiced over. It definitely didn’t sound like him. I was just wondering if anyone else noticed and maybe knew why. I noticed the same thing — it almost sounded like the voice actor who played Sgt Zale dubbing Jeff Maxwell’s Igor. Addendum: I am referring to a scene in “Fade Out, Fade In”, not “For want of a boot” (which Charles obviously was not a part of).